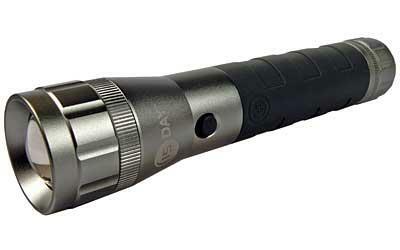 Super bright and ultra heavy-duty, the 15-Day Flashlight outshines the rest with an incredible 15-day burn time on two D-cell batteries. The unique "moonbeam" lens shines a remarkably bright light beam which is uniformly cast to provide a crisp, broad circle of light with no hotspots or dark areas. Runs 10 hours continuously on "high"